The Pere Marquette 1225 might be one of the most famous trains in North America, but most know it as the Polar Express, and it’s sitting right down the road. The 1225 was one of the steam engines built in 1941 for the purpose of transporting supplies to World War II factories. Coming in at over 100 feet long and 400 tons in weight, the 1225’s engine runs at 3,000 horsepower, requires a ton of coal for every 12 miles, takes eight hours to fire up, and requires 10 – 15 people to run. The locomotive, built at a cost of $200,000 ($2.5 million today), is the largest to ever run in Michigan and was only used for a decade. Diesel and other less expensive forms of power were taking over the market, and the era of the steam engine was at an end. After the war ended, the 1225 was transferred to a scrap yard in New Buffalo where it remained until 1957. The 1225 was officially commemorated on June 12, 1957. Forest Akers and other MSU dignitaries were present for the occasion. The crew of Project 1225 distributed brochures explaining their mission and selling detailed drawings of the locomotive for restoration funds. an argument, and the 1225 was officially welcomed to campus in June of 1957. “Welcome” could be a generous word. MSU publicly considered the engine to be an eyesore, and the 1225 sat unused just south of Spartan Stadium until Randy Paquette assembled an organization of fellow students to restore the machine in 1969, under the name of Project 1225. Worried by the timeliness, cost, and danger of the steam engine, MSU proclaimed that should the students cease work on it at any time, the machine would be scrapped immediately. Many of these students say that had they known what was in store during the restoration of 1225, they never would have started the project. Few of the original student crew were in the Engineering department, and zero of them had experience in locomotive construction. One quote summarized this succinctly, “…no shop building, no crane, no drop pit, no tools, no supplies, no experience, and no money.” Just to get power at the work site, a 400 foot extension cord was snaked across streets and through an open window. This photograph came from Vol. III, No. 6 of the Project 1225 Bulletin, and it shows some of the original boiler crew. After 20 years of financial woes, the Michigan State Trust for Railway Preservation was formed in 1979 to raise money for restoration in order to make a “working relic” out of the 1225. The locomotive found a new home in 1983 off of an old rail line in Owosso, Michigan, where it still resides under the jurisdiction of the Steam Railroading Institute. The building was refurbished to provide a workshop for easier repairs and more suitable conditions for the workers themselves. Their work paid off. The restoration was completed in 1988 when the train took its first trip to Chesaning (which it does every holiday season now), at a total final cost of $1 million. The students of 1971 estimated it would cost at most $30,000 and only take a year. The Pere Marquette 1225’s most recent claim to fame came in 2004, with the premier of the cartoon The Polar Express. The author of the original famous children’s story, Chris van Allsburg, grew up in Grand Rapids, Michigan, which was a regular part of the Marquette’s route. During filming of the movie, sound and design technicians from Warner Brothers regularly worked with the employees of the Steam Railroading Institute, receiving schematics of the train’s design, as well as traveling to Owosso to record the locomotive itself. The Pere Marquette is only one of 6 or 7 engines of its kind to be operational in the US today. More information about rides and tours can be found at the Steam Railroading Institute’s website here. This image of the 1225 in action was taken by Robert Emmett for the 1992 Newsletter of the Michigan Trust for Railway Preservation. A lane in Quonset Village. 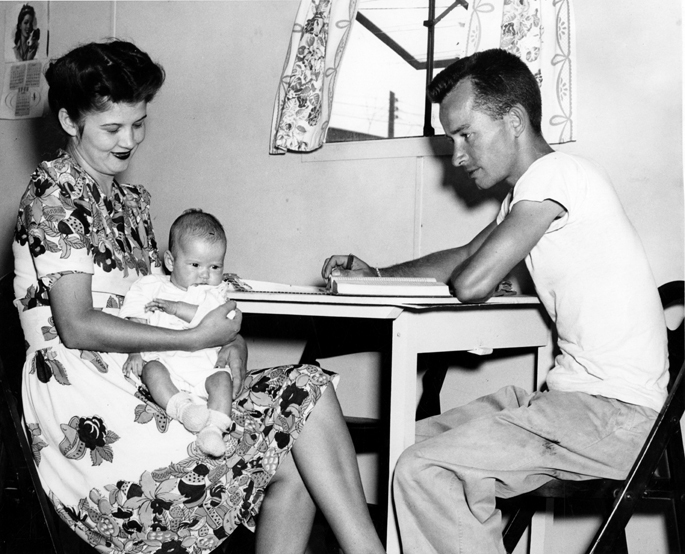 A veteran studies in his Quonset home with his wife and child. for an education with the help of the G.I. Bill. Veterans, often with wives and children, were done with their service and were enrolling in schools across the United States in great numbers. This could have presented MSU with a serious housing problem, but the college was prepared for this influx of students due mainly to President Hannah’s foresight. 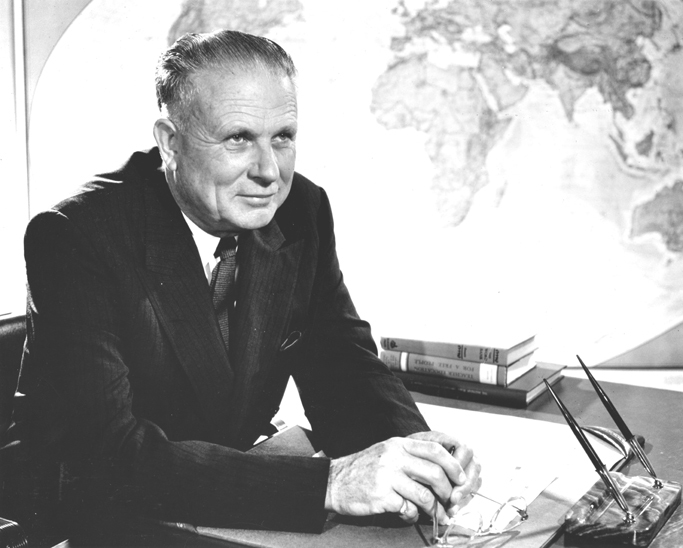 Due to the fact that he was working with a limited amount of time, Hannah arranged for a village of temporary housing units, called Quonset huts, to be installed on campus in 1945. Hannah organized space for these huts on 30 acres of campus land that was previously a poultry plant. Where today stand married housing facilities and university apartments, in 1945 stood 104 prefabricated steel Quonsets. The structures were brought in from towns around Michigan where they had originally been constructed as emergency war housing, and they were placed next to the Michigan State Police Headquarters. Many of the Quonsets were for families, but some of the buildings were also communal housing with common areas and bunks that would sleep up to fourteen men. In addition, the village had a series of larger huts to accommodate a cafeteria. 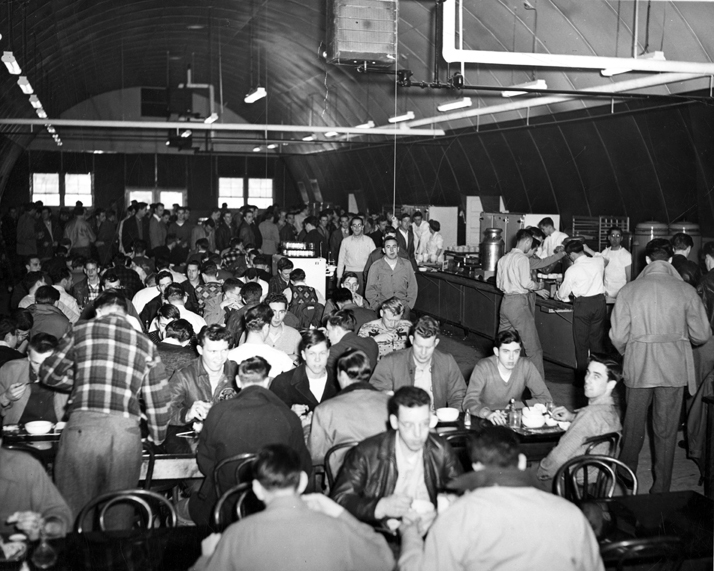 Students crowd the Quonset cafeteria for a meal. 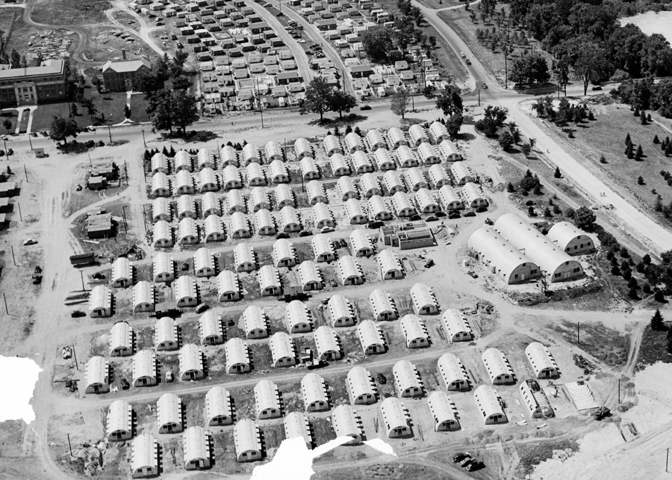 The Quonset village is among the many buildings and facilities that no longer exist on MSU’s campus, only this was indeed a very real village, as can be seen from its aerial photographs. Within five years, permanent dormitories were being built to accommodate the growing student population. 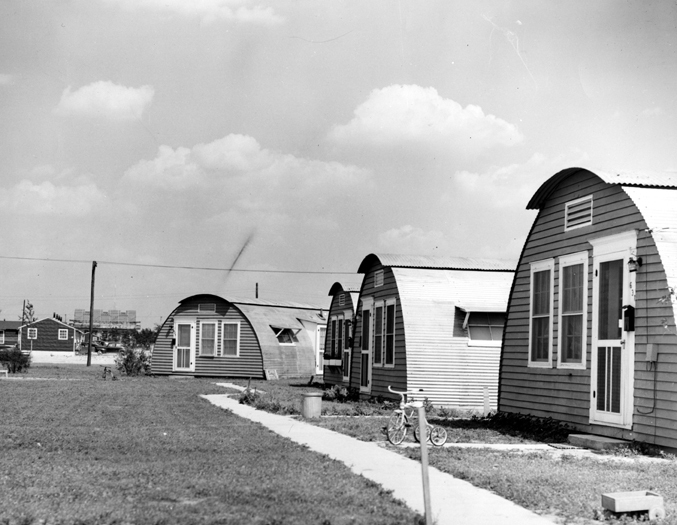 It took several years for permanent facilities to catch up with the space provided by the Quonset Village, but once they did the Quonset huts were deconstructed and plans were begun to construct the permanent married housing units, which are still in use today on the same site. An aerial view of Quonset Village. Commencement ceremonies for Michigan State University will be held on December 9 and 10 at the Jack Breslin Student Events Center. This fall 1,730 undergraduate and 753 graduate students will receive their degrees. 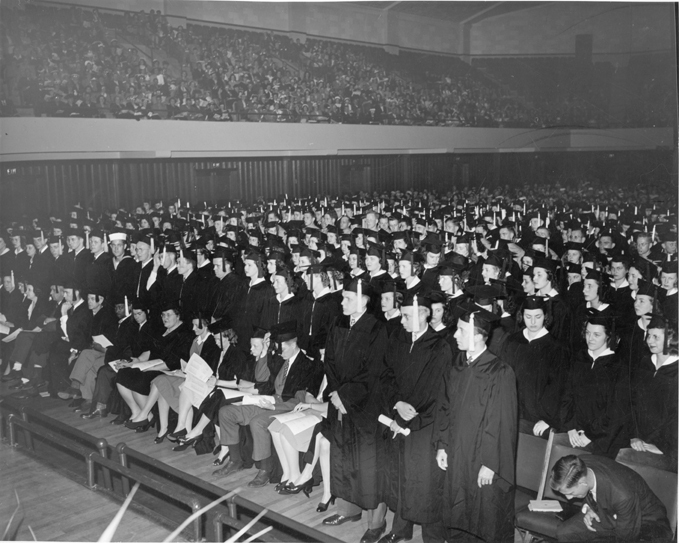 In honor of commencement the University Archives wanted to give the graduates some advice from a past President of the University. “Finally, because this will be my last opportunity to talk with you seniors as a group, I want to talk a little about Michigan State College and your personal relationships with it. Up until the moment you receive your diplomas, you have been free to sever your connections with Michigan State at any time. “But once you accept your diplomas . . . your status changes and you become a part of Michigan State College forever. You cannot disown the College, and the College cannot disown you. “Never forget that the reputation of this College depends to a large extent on the records and reputations of its alumni. For that reason, Michigan State will always be interested in you and what you do. And if at any time Michigan State College can be of service to you in the years ahead, do not hesitate to ask for that help. It will be given to you, freely and willingly. “There is another side to this relationship: to some degree, you will always be interested in the good name and welfare of this College. Its stamp of approval is upon you forever, and if its prestige as an educational institution grows, so will the worth of your affiliation with it. But if it should fall on evil days, the value of your association with it will decline. “So I must remind you that as you are to feel free to call on the College for help, so the College is free to call upon you for help in the time of trouble.